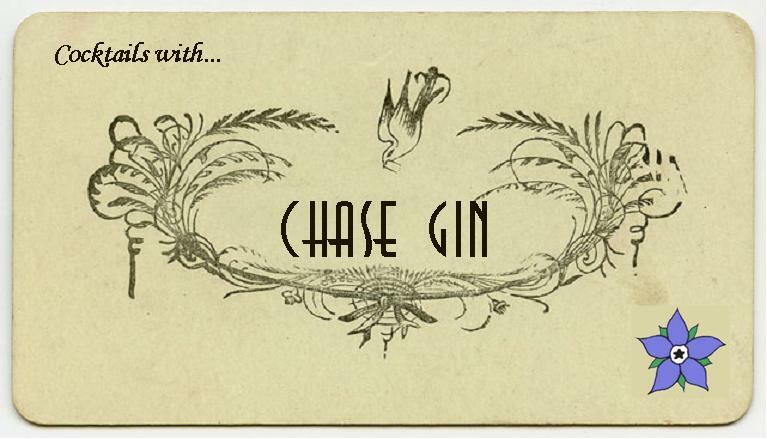 I first came across the Chase drinks company at the 2008 Boutique Bar Show where I tried some of their fruit liqueurs, I was also told that there was a Gin in the pipeline, naturally this intrigued me. In addition to a Gin, Chase also make an array of vodkas including their Potato Base Vodka, voted “Best Vodka in the World 2010” and a selection of fruit liqueurs and even a Sloe Gin. Nose: juniper, some angelica and some wheaty savoury notes. Taste: silky and warm but still flavourful, strong juniper and citrus notes. A strong G&T both in terms of flavour and ABV once the ice has melted a little, the drink has a wonderful chill which, along with the apple garnish, brings out the crisp freshness of the gin. an excellent standard for a Martini, cool crisp but still with a burst of flavour; as you should expect from a Gin Martini. Juniper and Coriander really come through. Cool and refreshing drink, very pleasant but it doesn’t really bring out the best in the gin, which seems a bit lost in the drink. Very very smooth, the Gin is rather understated in this cocktail. This is a great drink but perhaps doesn’t give the Gin the showcasing it deserves. As ever the Gin Old Fashioned is an excellent drink, brings out the flavours of the gin and as they are only complimented by sugar, water and a touch of bitter the full profile of the gin can be appreciated. Truly recommended. Quite a tart Bramble but still pretty tasty. Has all of the cooling freshness you would expect from this drink but the flavours of the gin seem a bit hidden. Sadly there seems to be a bit of a clash between the gin and the ginger ale. I don’t think this drink brings out the best in the Gin and I wouldn’t it really recommend it. The addition of sugar syrup brings out some more of the botanicals, turning the Chase Gin into more of a Gin liqueur, the liquorice, elderflower and the faintest hint of apples comes out when the Gin is mixed in this way. What a great drink, an often forgotten classic but the lemon juice, Chase gin and herbal Galliano mix really well together, each bringing something different to the drink. Cool, delicious and raising for the appetite. Not all Gins work well in a Pink Gin but Chase appears to be one that does; Chase’s botanical mix is relatively low on spices and so the Angostura brings this side of the flavour spectrum to the drink. Soft smooth with a hint of spice at the end. Lovely. From the cocktails we’ve tried it seems to me that Chase Gin works best in simple cocktails, with my preference on it being used in, with the exception of the Gin & Tonic, short drinks. Definitely some highlights were the Gin & Tonic, The Martini and the Pink Gin. With the Milano and Gin Old fashioned also being highly recommended. This updated (March 2012) document outlining the idea of a contemporary style of gin an the New Western Gin terminology is reproduced here thank to kind permission by Ryan Magarian. The New Western Dry Gin making philosophy seems to have evolved over the past 12 years, as a result of efforts from both large brand houses and regional distillers in Europe and in the United States. In taking a good hard look at today’s rather loose definition of dry gin, these distillers realized a greater opportunity for artistic “flavor” freedom in this great spirit and are creating gins with a shift away from the usually overabundant focus on Juniper, to the supporting botanicals, allowing them to, “just about”, share center stage. And while the juniper must remain dominant in all dry gins to achieve definition, these gins are most certainly defined, not by the Juniper itself, but by the careful inclusion and balance of the supporting flavors, creating, what I believe to be, an entirely new designation of dry gin deserving of individual recognition. As I see it, Tanqueray should be credited with bringing the first true New Western Dry Gins to market, initially with Malacca, which was quickly discontinued (perhaps because it was misunderstood), and later with Tanqueray Ten, an outstanding product, that I believe opened the door for a growing number of free thinking gin makers to have the confidence to become more creative with their personal interpretation of the storied spirit. Launched in 2000, the intent of this product was clearly to create a gin with a focus away from the Juniper and onto it’s more mainstream citrus flavors, and along with its stunning “vodka centric” packaging, it’s purpose was clear; To infringe on the success of a much larger spirit market; Flavored Vodka. This approach was next successfully realized when Hendricks Gin, launched in 2002, made a huge splash worldwide, drawing in the very same drinker with it’s promises of weighty flavors of cucumber and Bulgarian rose petal. So, after looking at the cross section of New Western Dry Gins, I think most of them would fall into the Distilled Gin (Hendricks, for instance) and London Gin production designations (define below,) which insure a high quality and fully integrated palate. Mistaken Identity/Modern Dry Gins that I had suspected were New Western Dry Gins, but in fact, I believe, fall into the London Dry category based on heightened Juniper presence. London Gin is made in a traditional pot still by re-distilling ethyl alcohol in the presence of all natural flavours used. The ethyl alcohol used to distil London Gin must be of a higher quality than the standard laid down for ethyl alcohol. The methanol level in the ethyl alcohol must not exceed 5 g. per litre of pure alcohol. A small amount of sweetening may be added after distillation provided all sugars do not exceed 0.5g per litre of finished product (the sugar is not discernible and is added to some products purely for brand protection services only. Nearly every gin on every back bar today falls into this category and is considered of the highest quality. Believe it or not, this gin can be produced anywhere in the world, must be made from neutral spirit, and have a predominant Juniper flavor with the supporting botanicals playing an extreme secondary role. Examples included Tanqueray, Gordon’s, Beefeater, and Boodles. This gin is both a brand and Designation of Origin, meaning it must be made in Plymouth, England. The fact that this style is made from a 100% wheat based neutral spirit, includes no bitter botanicals, and is softer, earthier, cleaner and slightly less junipery than its London dry counterparts, are recognizable points of differentiation. Whew, now that’s sentence!!! The only existing example of this, of course, is the Plymouth brand rendered at the Black Friar Distillery in Plymouth, England. The New Western style of Dry Gin seems to have evolved over the past five years by efforts from regional distillers in Europe and the United States. In taking a good hard look at the loose definition of modern dry gin, these distillers realized a greater opportunity for artistic “flavor” freedom in this great spirit and are creating gins with a shift away from the usually overabundant focus on Juniper, to the supporting botanicals, allowing them to, “just about”, share center stage. And while the juniper must remain dominant in all gins to achieve definition, these gins are most certainly defined, not by the Juniper itself, but by the careful inclusion and balance of the supporting flavors creating an entirely new category of gin and giving the discriminating imbiber, not to mention the modern bartender, an entirely new world of flavors to explore. Other key characteristics of New Western Dry Gins include the selection of a more obscure set of supporting botanicals and a definite imprint of the region from which the spirit was born. Since launching Aviation Gin, a gin just about everyone will agree, is way out on the fringe of modern gin making, my mind has been in overdrive not only working to truly understand the nuances of the long existing Dutch, London Dry, and Plymouth Gin designations, but in articulating a place for mine and other similar gins to reside. Identity – In order for any product to find a market, it must have a clear identity making it immediately recognizable to its potential consumers. In my opinion, for the Aviation’s, Hendrick’s, and other gins discussed above to have any chance at long term success, they need to have a recognized designation of their own, signaling their unique production and carving out a clear understanding of product for those potential consumers for years to come. 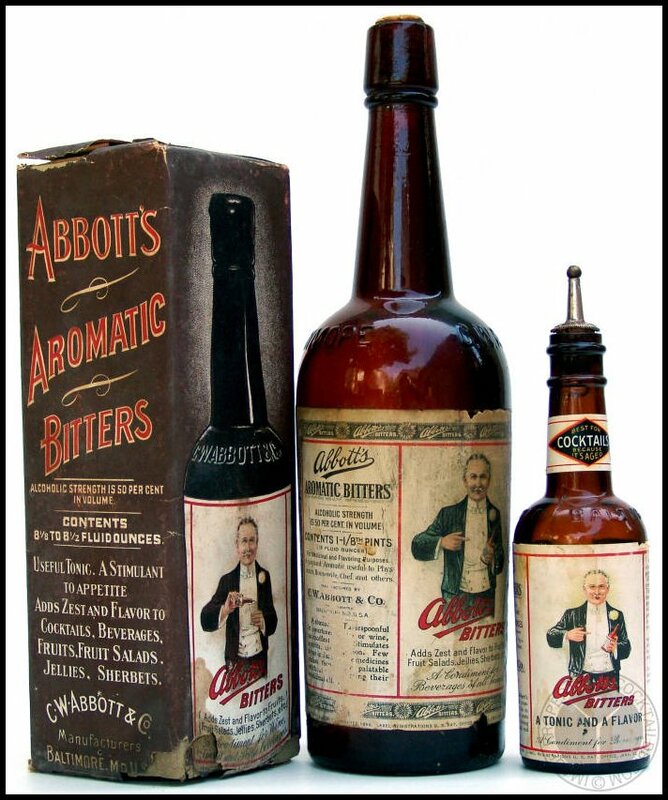 The Old Abbotts Bitter - Thanks to CocktailDB for Picture. 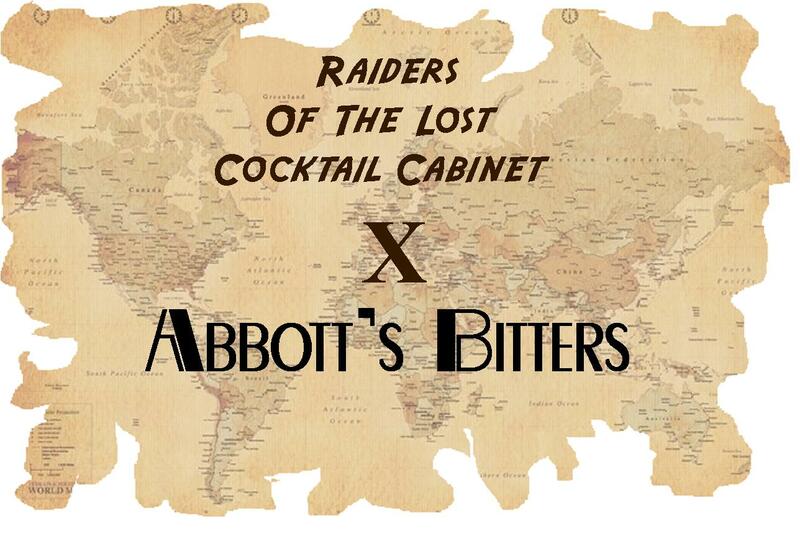 There has been a bit of break in episodes from Raiders of the Lost Cocktail Cabinet so, to make up for this, this weekend we have a double-feature on long-lost bitters.Part one focuses on another ingredient whose demise is lamented in ‘Vintage Spirits and Forgotten Cocktails’, Abbott’s Bitters. These were produced by C.W. Abbott of Baltimore until the 1950s, which suggests that they survived Prohibition (no mean feat). The Cocktail Database describes them as one of three most important aromatic bitters brands of the twentieth century, alongside Angostura Company and Peychauds.Recreation of these bitters today, even with a recipe, is a little tricky as Tonka Bean was a key ingredient, which is now banned in food and drink in the USA. Even in countries where it can be consumed, it is heavily regulated.Through the grapevine, I heard about a project that Bob’s Bitters were working on and I was very pleased when Bob from Bob’s Bitters was kind enough to send me a sample of his brand new Abbott’s Bitters. For the story of how the bitters were resurrected, click here. The bitters adds an extra level off flavour, with additional hints of almond, amaretti and a touch of cinnamon, as well as other fruit and spices, somewhat reminiscent of simmnel or fruit cake. It matches well with the Martini Rosso and the Wild Turkey Rye – quite excellent. There’s quite an autumnal or wintry feel from the sweet spices in this cocktail. It’s a little reminiscent of gingerbread or mincemeat, but not in a sweet way. The Sloane’s Gin worked well and both Mrs. B and I really liked this, thinking it quite Christmas-y. Unusual flavours, quite dry and a touch of anise. Bitter add an extra complexity and the vanilla note went well with the pastis. Bracing and rousing for the appetite. Absolutely lovely. A hint of smokiness comes through. It’s a little lighter and creamier than the same drink made using Angostura. A caution would be to not put too much sugar in, but, really, this drink is just great. A pale yellow colour, and clean and crisp; the middle has a touch of smokiness and then there’s some cloves and Christmas spice on the finish. 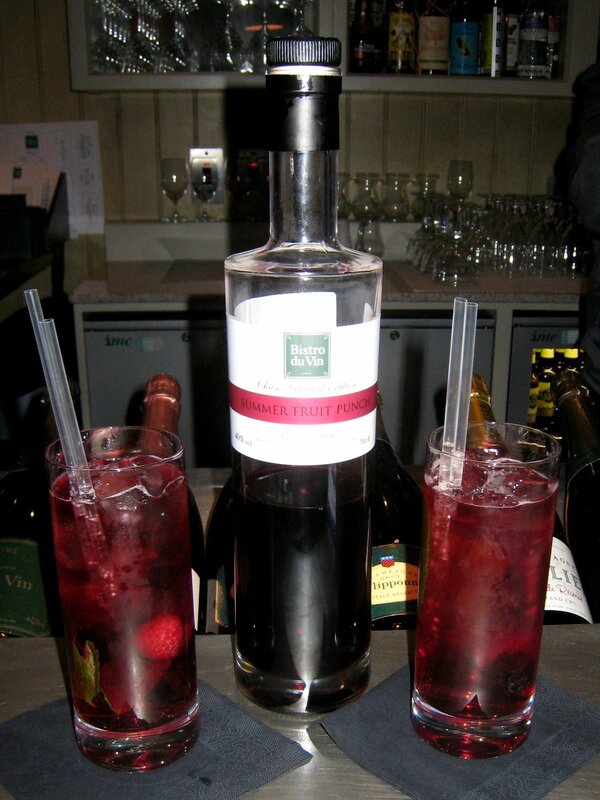 The bitters works well with Sloane’s Gin, making a drink with a long finish. More fragrant than most Pink Gins, but the cinnamon/sweet spice notes that you get when using angostura is still present, so there is still an element of familiarity. 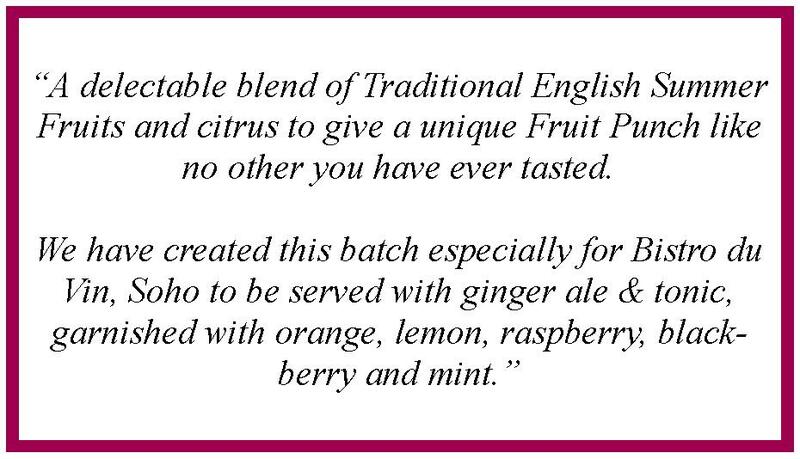 There’s a huge amount of flavour and it it works very nicely with the Sloane’s Dry gin. 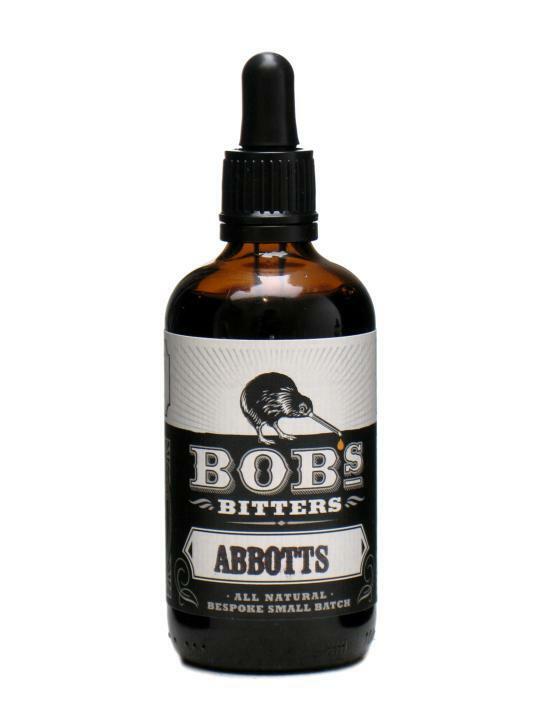 In a similar way to Boker’s, I am very glad that Abbott’s Bitters has been resurrected; to my mind it is a sweeter, lighter and more confectionery type of bitters and, as such, has its own niche to carve out. I see some really great potential uses in Autumnal or Winter cocktails. Our favourite drinks were; Martinez, Manhattan and Old Fashioned. Since the hunt for Uganda Waragi, no spirit has alluded me more than the mysterious Chase Fruit Cup by William Chase. 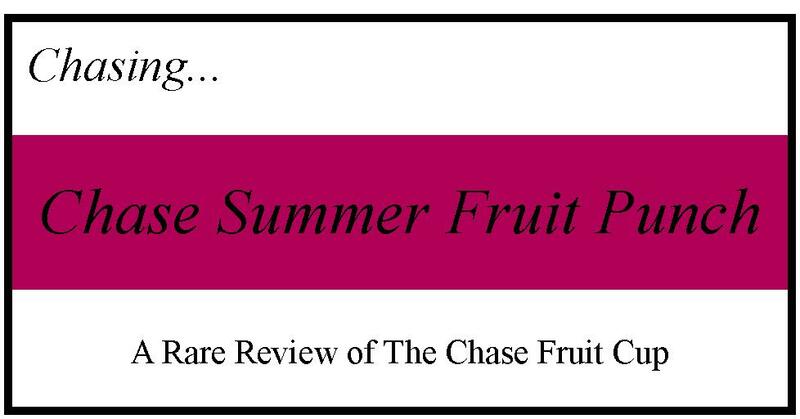 Last month saw the release of the excellent Sipsmith Summer Cup and so I was keen to see how the Chase one shaped up. I was originally told about its existence and its exclusivity by a chap in a bar, but, at the same time, I was being told that it was exclusively for a particular client. After a series of false leads and disappointments, I received a tip-off yesterday as to where I could find some. Luckily, I was in town that evening* and so yesterday we popped into Bistro du Vin, Dean St., Soho. Chase’s Fruit Cup is vodka-based and is actually described as a “Summer Fruit Punch”. It was made exclusively for the Grand Opening of the Bistro in Soho, with the production run being limited to just 24 bottles. It is also unusual as it is bottled at 40%ABV; most Fruit Cups, including Pimm’s, are bottled between 20 and 25%ABV, with the premium likes of Plymouth and Sipsmith being bottled at 30% and 29% ABV, respectively. The colour of Chase Summer Punch is a rather vibrant deep crimson; a very berry-like shade. It is bottled in their usual tall bottle, with their standard limited edition label (see Chase Smoked). Here is the text, in full, from the back of the label. It is rare that people drink Fruit Cup on its own, but in order to get an idea of the spirit’s character, I thought I’d give it a bash. Nose: Very strong; a fruity nose, with sharp berry notes such as sloe, damson and blackcurrant. There were also some bitter, leafy-green notes, like crushed mint. Taste:Full of berry jamminess; sweet, but also quite tart. This does not feel like you are drinking a 40% spirit, but rather a 20% liqueur. As Chase suggests, this is unlike any other Fruit Cup and has some distinct Cassis-like qualities. Mrs B. also picked up a little salty savouriness too. The traditional mixer for a Fruit Cup, although not their serving suggestion. This drink had very strong, sharp, sweet berry notes and was also quite sweet and reminded me a lot of blackcurrant squash/cordial & lemonade or Cassis & soda water. The drink lacked any herbal complexity that you would expect from a Fruit Cup and, for me, was just too sweet. I think this is why lemonade is not the recommended serve. 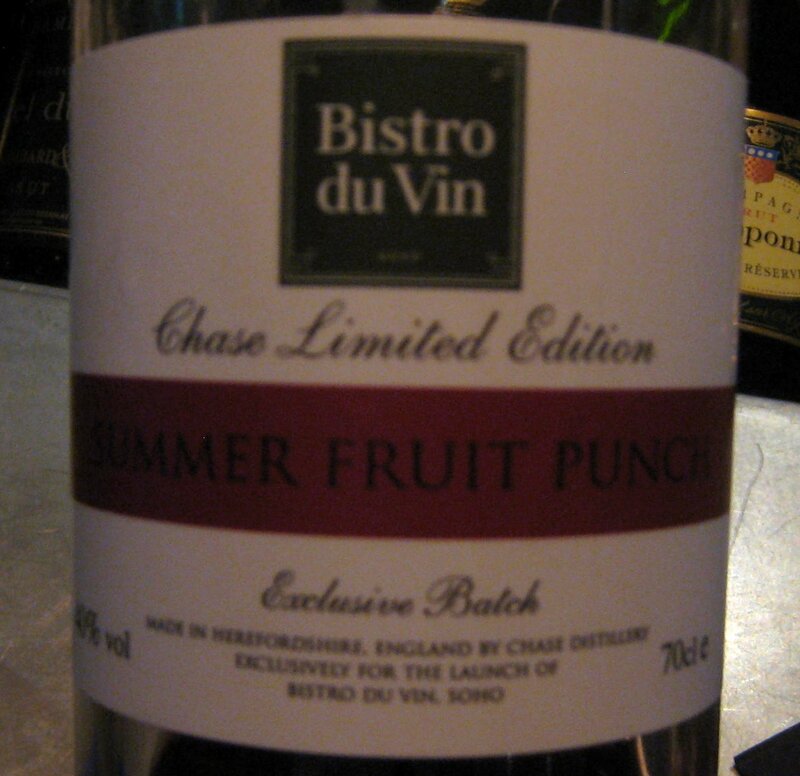 This is the suggested serve for Chase Summer Fruit Punch and mine was garnished with lemon, blackberry and mint. This was much better than the lemonade and the sweetness was far more balanced. Once more, there was a disappointing lack of herbal notes, although the drink does have a lot more depth when mixed this way. With the strong berry flavours and the ginger, this started to have rather an autumnal feel, which I quite liked. If it had some more fiery ginger notes it would be even better. Inspired by the desire to mix the Punch/Cup with some more fiery ginger flavours, I decided to try it with ginger beer. The stronger ginger was certainly an improvement, but the downside was that the ginger beer was quite sweet and so the drink became a bit sickly. The bartender suggested adding a little lime to balance it out and I think that would work well. Alternatively, using a less sweet ginger beer, such as Breckland Orchard or Luscombe Fiery, would work. Once again, the underlying sweetness of the Cup/Punch makes it harder to mix with. I’m really glad that I got a chance to try Chase’s Summer Fruit Punch and it certainly fulfills the label’s promise to be “a unique Fruit Punch like no other you have ever tasted”, making it a welcome innovation to the market.I’d like to see it have wider distribution, but, for me, it needs to be less sweet. I think that the high levels of sugary sweetness would turn a lot of consumers and bartenders off.In addition, some more herbal notes would add some depth and sophistication to the flavour and I think these could be incorporated without the loss of the unique berry profile of the product. Finally, the 40%ABV that the spirit is bottled at seems an odd choice and I would suggest reducing it to something like 30%. This is assuming that the reduction in proof would not seriously adversely effect the flavour and I don’t think it would. Although the drink doesn’t taste very alcoholic, a few glasses of this drunk in quick succession could really creep up on you. Also, a 40% spirit will need to have a higher price point than a 30% one, if only for the higher duty that would need to be paid, making the product less competitive. 2011 has been an exciting time for the world of Fruit Cups and hopefully 2012 will see a larger production run of Sipsmith Summer Cup and a further offer from Chase, too. Thanks to Caroline, Laura, Nick and Rob for their help with this article. * It was the New Sheridan Club Night and we received an excellent talk on Mother of Pearl. The Old Sixteen Rum is a variation on the Sixteen Rum. The original cocktail name apparently comes from a Count in Piedmont who served this drink to attract young and fashionable guests to his home. The cocktail then became popular with the elite and the more sophisticated circles of Italy, especially at receptions and parties. It is said that the drink is offered as a token of esteem and as a wish of success to guests (mainly in the field of love). Very pleasant, the lemon bacardi makes a fresher, more furity drink and the Martini continues to add a complex herbal note with the dash of Antica bringing some deeper, more bitter notes. 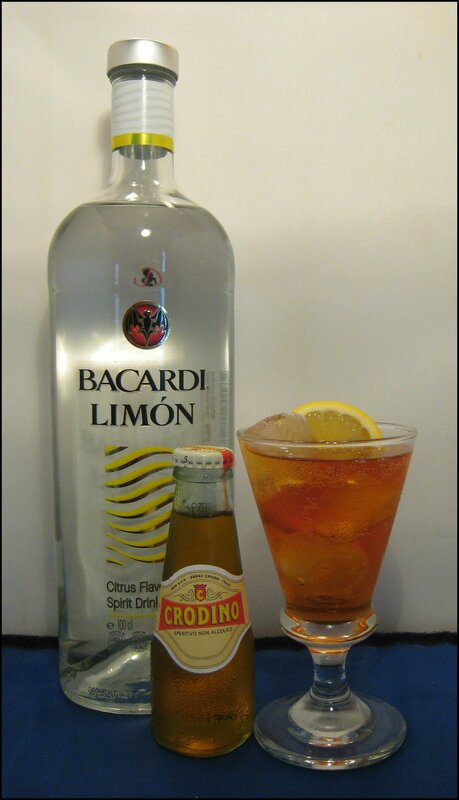 As before the balance between the Crodino, Bacardi Lemon and vermouth is spot on but this time there is even more flavour is even more intense. Apparently this variation is popular at reunions of old friends and is thought to bring back memories of good times past. It also goes very well with a cigar. I got a lead on Crodino from Billy of Billy’s Booze Blog, so first off, my thanks to him. 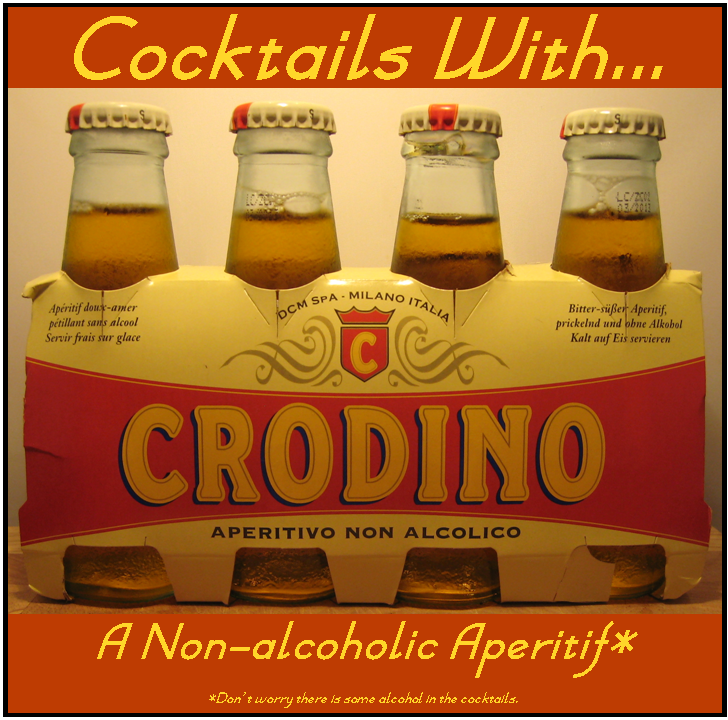 Crodino is a non-alcoholic aperitif made by the Campari Group. It gets its name from Crodo, the area in north-west Predmont where the product has been bottled since 1964. 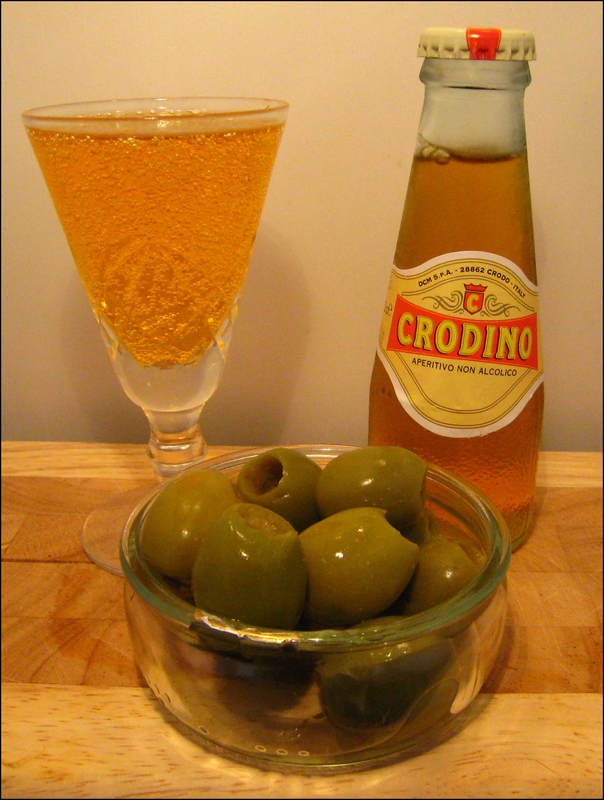 According to their website, Crodino is the most consumed and most famous non-alcoholic aperitif in Italy. Under the brand “Crodo”, Campiri make Chuotto (a citrus and cinchona mix), Lemonsoda, Oransoda, Pelinosoda, Tonicsoda and Mojitosoda. All of these are non-alcoholic. Campari also make Campari & Soda (this was very popular in Italy and available in small flasks), as well as Aperol & Soda and a premixed Cinzano. 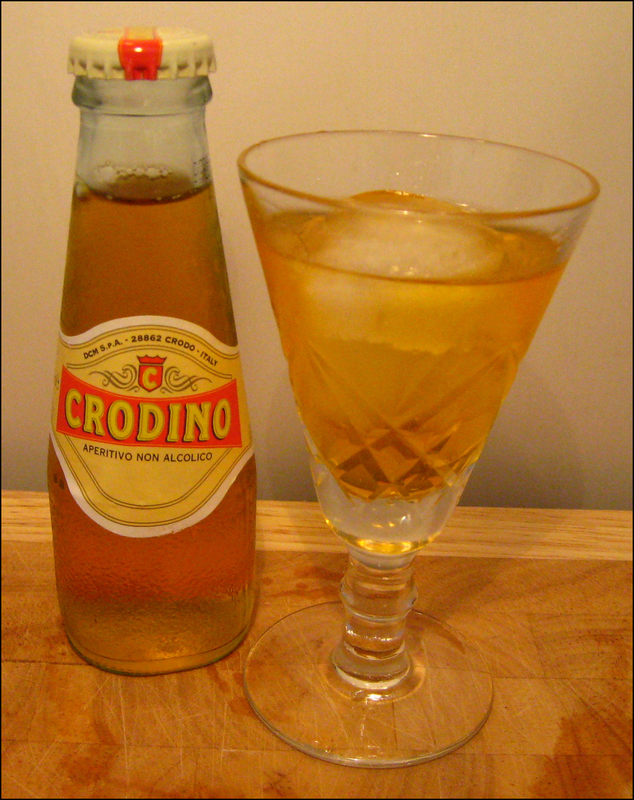 I was interested in Crodino as a drink, but in addition, given the nature of this site, it’s mixer potential appealed immensely. 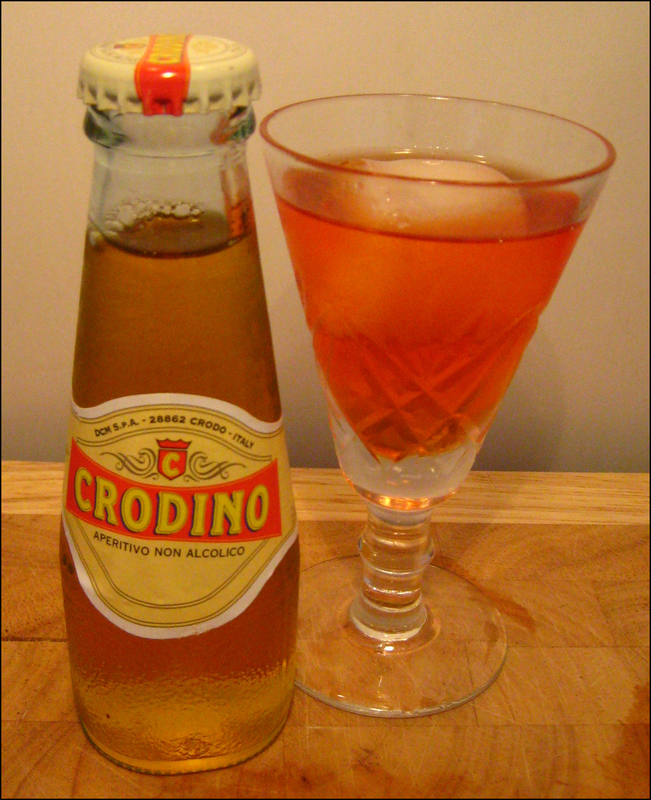 Crodino is a bright shade of rust-orange, similar to the Scottish soft drink Irn-Bru. There is certainly a bitter-sweet character to it. Very sweet and syrupy at the beginning, with hints of vanilla and a touch of orange. After this comes the herbal bitter notes which are good way to round off the drink. For me, this was best served with lots of ice and a squirt of citrus fruit. After some investigation, it appears that the signature cocktail for Crodino is the Sixteen Rum. The name apparently comes from a Count in Piedmont who served this drink to attract young and fashionable guests to his home. The cocktail then became popular with the elite and the more sophisticated circles of Italy, especially at receptions and parties. It is said that the drink is offered as a token of esteem and as a wish of success to guests (mainly in the field of love). This was delicious: the balance of the vermouth and Crodino, with some freshness added by the lemon and fortification, is just right. It’s worth experimenting, but I’d recommended a light rum for this drink. The perfect drink to welcome guests and completely refreshing. A variation, known as Old Sixteen Rum, uses 5 yr old Martini Rosso and Bacardi Lemon-flavoured Rum. This is popular at reunions of old friends and is thought to bring back memories of good times past. Apparently it goes very well with a cigar. I used Taurus Gin, a good staple of the London Dry category, and mixed the drink as I would a Gin & Tonic. 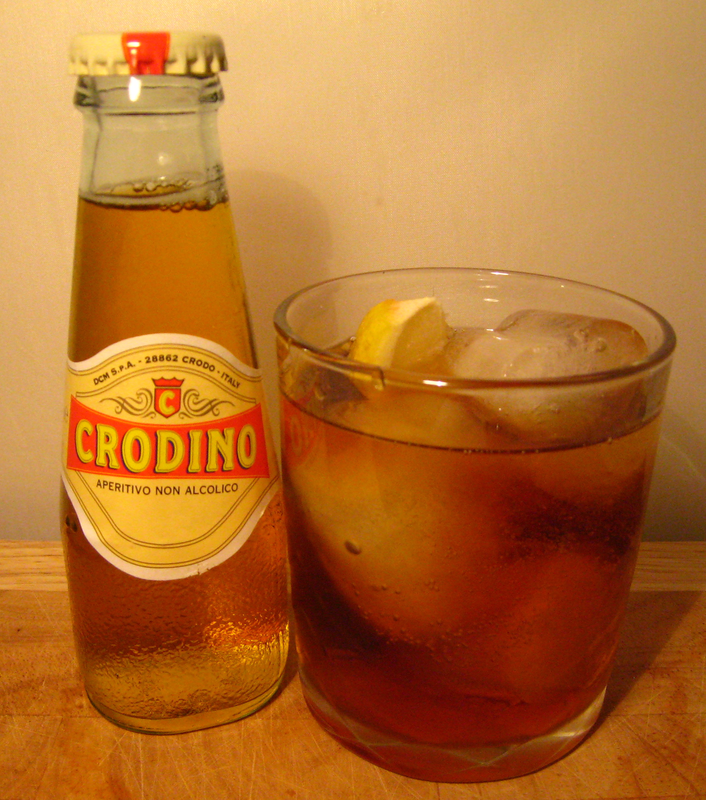 Sadly, the Crodino was too sweet for even a dry gin and the resulting mix was rather sickly. A simple drink, which was refreshing with a slice of orange or lemon and created a very enjoyable and refreshing aperitif. 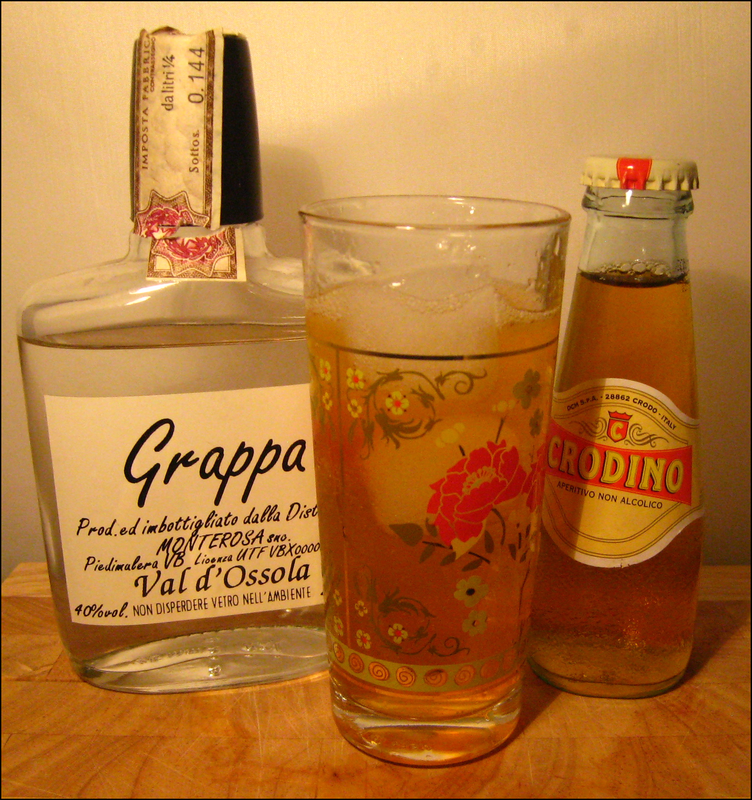 The vermouth takes the sweet edge of the Crodino, but does not cover up its other flavours and complements the mixer’s taste with some more bitter herbal notes. .Inspired by the fact that the sweetness in the Crodino needs a little taming, I added Campari to the mix. 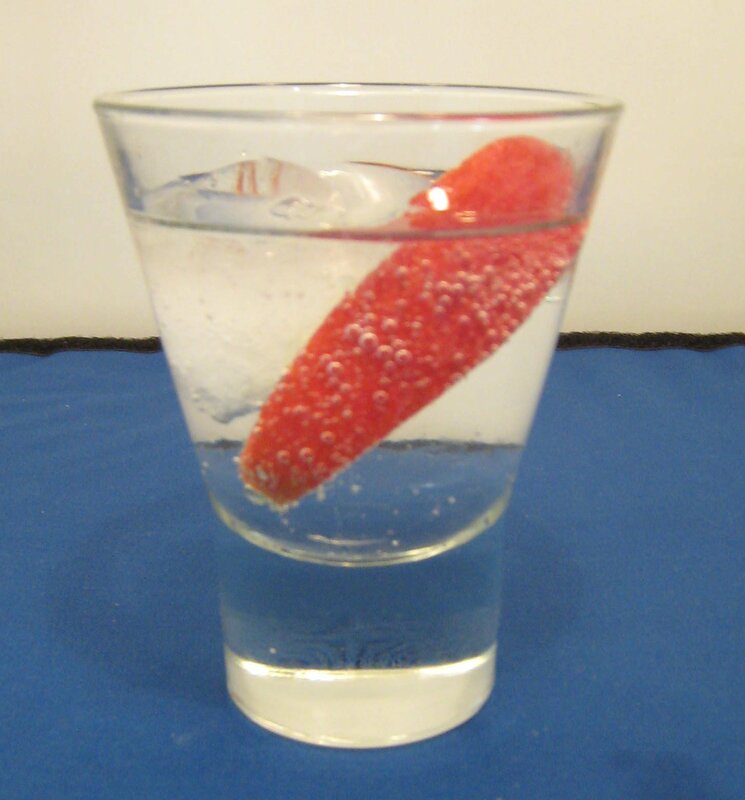 This produced a superior drink, with the the bitter-sweet element of a drink like a Campari & Soda. Fruity and herbal, the drink improves further with the squeeze of a lemon wedge. This was originally meant to be a Collins-type drink. I thought that the addition of sugar syrup would be unnecessary and wanted to make it more Italian, so I subbed the gin for Grappa. Dryness comes form the Grappa, tartness from the lemon and a bitter-sweetness from the Crodino. It is complex and fruity with hints of fruit, fruit stone and almond. This is definitely a different sort of drink and, in its own way, very refreshing; it won’t be everyone’s cup of tea, but maybe for a more seasoned palette it will be a delight. It has a pleasant aftertaste, but it’s a clean one and so doesn’t impact the flavour of what you might be supping next. Mrs. B described it (in what I’m told is a good way?) as a “taste onslaught”. I think Crodino is a great product and is great fun to experiment with. I’m not sold on how much I like it as a soft drink (it just seems to sweet), although, with a bit of lemon juice and ice, it become quite palatable (and remains non-alcoholic). In cocktails, it works well with those that can add some extra bitterness (Campari, Vermouth, Aperol) or tartness (citrus juice). Without question, my favourite drink was the Sixteen Rum and the Dry & Wry. Thanks to Billy, Alex, Duncan and all the folks at the Whisky Exchange for you enthusiasm, inspiration and encouragement in writing this article.